Let there be light! Synagogue architecture embraces new ethos – J. When Carol Booth took her mother on a recent visit to the construction site where the new Kol Emeth synagogue in Palo Alto is being built, it was still just a hole in the ground. But one of the workers said something that touched her. “He looked at us and said, ‘Oh, it’s going to be a wonderful synagogue,’” said Booth, wife of Kol Emeth’s Rabbi David Booth. Instead of dark wall paneling, picture light wood. Instead of stained glass, natural light. Instead of a raised bimah, a circle. Whether built from the ground up or renovated within an existing skeleton, new synagogue designs like Kol Emeth’s show the changing nature of what congregations want in their places of worship. Talmudic guidance on how to build a synagogue is limited — there must be windows, and the building should be taller than surrounding houses, for example. That leaves a big space for congregations to create their own aesthetic. American synagogues have a specific architectural history, from the “meshugothic” cathedral style to the embrace of Orientalism and Moorish elements. These styles can be seen in the church-like towers of the original S.F. Congregation Emanu-El building, built in 1866, and its current building, whose Byzantine look was popular when it was built in 1926. The original building of San Francisco’s Congregation Emanu-El was an example of what some have called the “meshugothic” style. Synagogues with those features still stand in older American cities. But the designs that emerged after World War II are the ones most familiar to the baby boomer generation. With restraint replacing ostentation and utility replacing grandeur, the style was shaped both by a reaction to the destruction of Jewish culture in the Old World and to the larger social forces afoot in the postwar era. That included migration to the suburbs, where families traded cramped city apartments for more space, both inside and outside. At one time, it was the block you lived on that marked you as Jewish; suburban living offered the choice to “opt in” to Jewish identity, or at least to blend in. Thus was born the U.S. synagogue of the 20th century’s second half, mirroring the needs, desires and lifestyles of a changing community that was looking to move on from the past. The interior of postwar synagogues, many of them Reform, tended to be more “theatrical,” said Susie Coliver of Herman Coliver Locus Architecture (HCLA), a San Francisco-based company known for its synagogue work. The sanctuaries had a stage-like bimah and rows of front-facing seats. 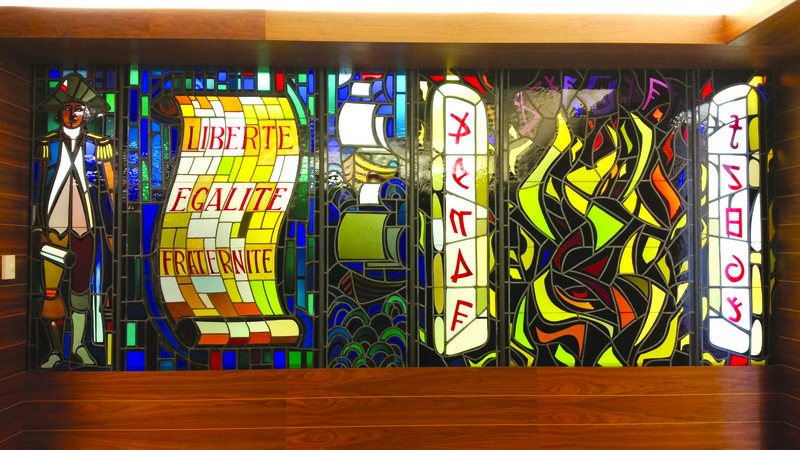 Stained glass gave the building a majestic look, while standard iconography — a menorah, a Magen David — stamped the space as Jewish. The sanctuary typically had a hall behind a folding wall that could be opened up for High Holiday services, and the exterior was often plain and featureless. One look at the natural light streaming into the sanctuary of B’nai Israel in Sacramento, which HCLA renovated in 2005, tells a different story. A formerly dark and cramped room was transformed into an airy, light-filled space. What was once a blank wall now has windows flanking a glass ark and framing the green leaves of trees outside. “That has become a big deal, wanting to see the sky, wanting to see the first three stars come out on Shabbos,” Coliver said. It’s part of a trend toward using natural light and opening up to nature, which in Northern California tends to be nearby and abundant. And that’s just one commonality in contemporary synagogue architecture. “We’ve seen a willingness to be overtly Jewish in affect, and a willingness to be more open to nature, community and the like,” Coliver said. Another change has been the move to the round, bringing the bimah down into the congregation instead of having the Torah read from on high in front of the ark. “What we’re seeing now is a shift away from ‘a community sits and watches and observes’ to longing to participate fully in the service,” said Steve Rajninger, an architect at HCLA. For Stanley Saitowitz, who designed Congregation Beth Sholom in San Francisco more than 10 years ago, the U.S. stage-type set-up is fairly strange anyway. In fact, the “in-the-round” sanctuary is traditional, found in ancient synagogues from Prague to Mumbai. “The buildings are incredibly modest, and they were actually centrally oriented and not stage-performance-oriented,” said Saitowitz, whose firm, Natoma Architects, also designed synagogues in San Diego, Philadelphia and Vancouver, as well as the new Berkeley Chabad. When Beth Sholom’s then-rabbi, Alan Lew, asked for a round space, Saitowitz knew what he meant. But there were some issues. “We couldn’t make a round building because there just wasn’t enough space,” he said. So Saitowitz not only brought the bimah down but also upended the circle, creating the “apple slice” shape that makes the Beth Sholom exterior instantly recognizable. The project was completed in 2008. “That was my interpretation of his desire,” Saitowitz said. Another trend is the yearning for a common space to draw the community together. “Almost every community we’ve worked with has come to talk about what we call the ‘living room,’” Coliver said. It’s a place to hang out, chat and relax; it’s the synagogue-as-coffeehouse, synagogue-as-park and synagogue-as-social-center. For Congregation Rodef Sholom in San Rafael, a courtyard will serve that purpose. 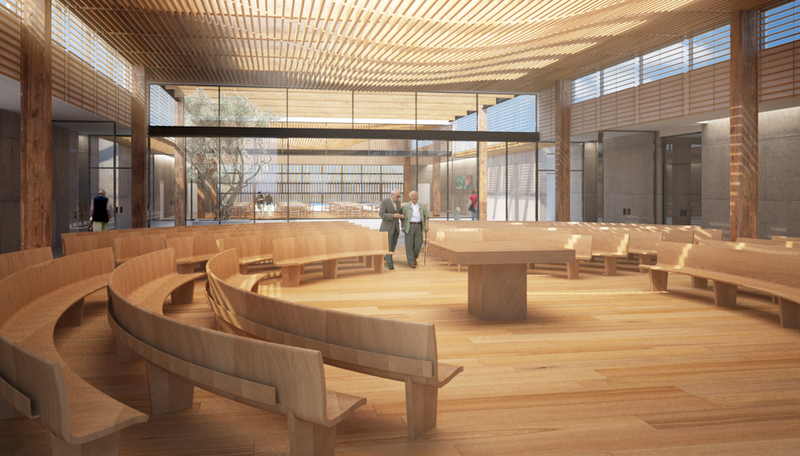 HCLA’s design for the new synagogue makes the courtyard a focal point, knitting into one community all three institutions on the Lonee C. Hoytt Jewish Campus, including Brandeis Marin school and the Osher Marin JCC. The sanctuary will be on the second floor, embracing nature with a “priceless” view, according to Marc Press, co-chair of the sacred space committee. He said it took some convincing to get people on board with climbing stairs to the sanctuary. But Coliver and Rajninger say creating such a purposeful path can help people enter a sanctuary in the right state of mind. It can be a beautiful experience and not one that involves navigating parking lots, offices or even, in one synagogue the architects saw, utility closets. “That wasn’t a very ceremonial path,” Rajninger said with a laugh. Another trend Rajninger sees, and likes, is more nuanced and subtle references to Judaism in Jewish architecture. Sometimes the symbolism is so subtle that it’s in fabric of the building itself. Architect Daniel Libeskind designed the Contemporary Jewish Museum to represent the letters that make up chai. Field Architecture is building Kol Emeth on the idea of the tabernacle in the desert: an undulating wood canopy in the sanctuary brings to mind both a prayer shawl and the heavens. “The tabernacle was a very humble structure, unlike the Temple [in Jerusalem],” Field said. More mainstream architectural trends have also made their way to sacred spaces. Tech is popular, with sanctuaries adding built-in cameras to live-stream services. Eco is in, and green building is de rigeur: Kol Emeth will be LEED platinum-certified. Synagogues also are moving away from the idea of providing a hall to accommodate the swell of congregants on the High Holidays. Not only is the folding-door solution awkward, but a large hall is hard to heat and cool. And Coliver admitted she kind of hates them anyway. “It means you don’t get a good social hall and you don’t get a good sanctuary,” she said. In addition to creating beautiful sanctuaries and community spaces, all synagogues must grapple with the question of security: both real security, how to keep intruders out, and perceived security, how to make people feel comfortable in their spiritual home. Coliver and Field agree that the process of designing a new synagogue or revamping a space is largely a process of listening to what makes that community special. “We start with an absolute blank space and we ask them to talk to us,” Coliver said. 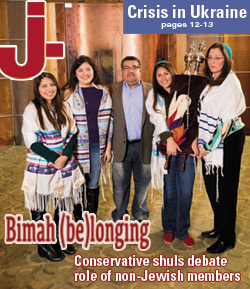 In addition to Kol Shofar in Tiburon and B’nai Israel in Sacramento, HCLA has worked on Peninsula Temple Beth El in San Mateo, Peninsula Temple Sholom in Burlingame, Temple Beth Abraham in Oakland, and San Francisco’s Sherith Israel and Ner Tamid, among other projects. But the questions don’t start with “What should it look like?” Instead it’s “Who are we?” It’s a way to find out what the congregation cares about. Before a single decision was made about aesthetics or functionality at Rodef Sholom, the community got together to talk about their identity. The architects listened. In the end, he said, the process means the finished building will reflect the vision of the collective Rodef Sholom community. “What they came up with doesn’t look like any other synagogue,” Press said. At the same time, there is no denying the similarities in many of the designs. 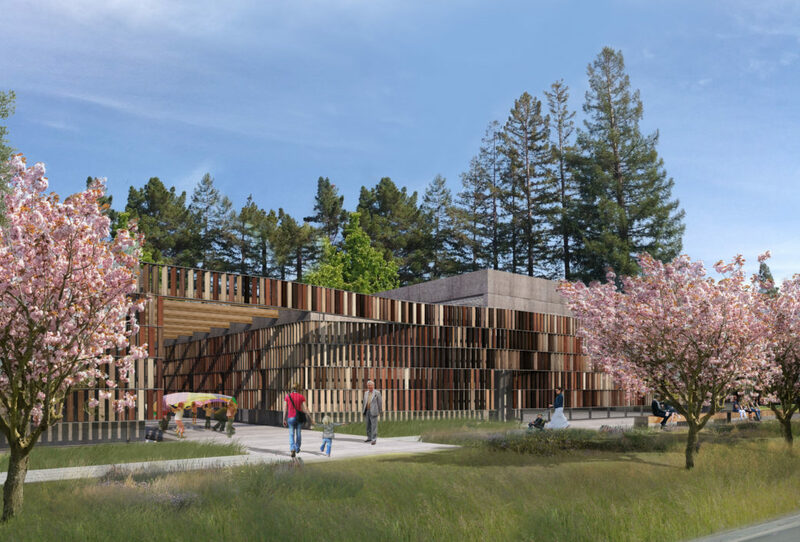 HCLA’s plan for Rodef Sholom includes a “draping wood-slat tallit ceiling,” while the Field plan for Kol Emeth has an undulating ceiling of thin strips of wood meant to resemble a tapestry or, yes, a tallit. A desire to maximize available light means a lot of blond wood and the deliberate use of shafts of sunshine moving through the building. Coliver also sees another trend she appreciates: the repurposing of space. “There’s a lot of fascination right now with appropriation and innovative reuse of existing facilities, and we’re seeing that as well in Jewish sacred spaces,” she said. These days you can find Jewish congregations meeting in nontraditional spaces, like Mission Minyan in the S.F. Women’s Building, or The Kitchen at a Quaker school, as well as the extension of worship spaces into nature, from services on the beach to the gardens at Berkeley’s Urban Adamah. This means finding a space for Jewish worship within spaces not solely designed for that purpose. 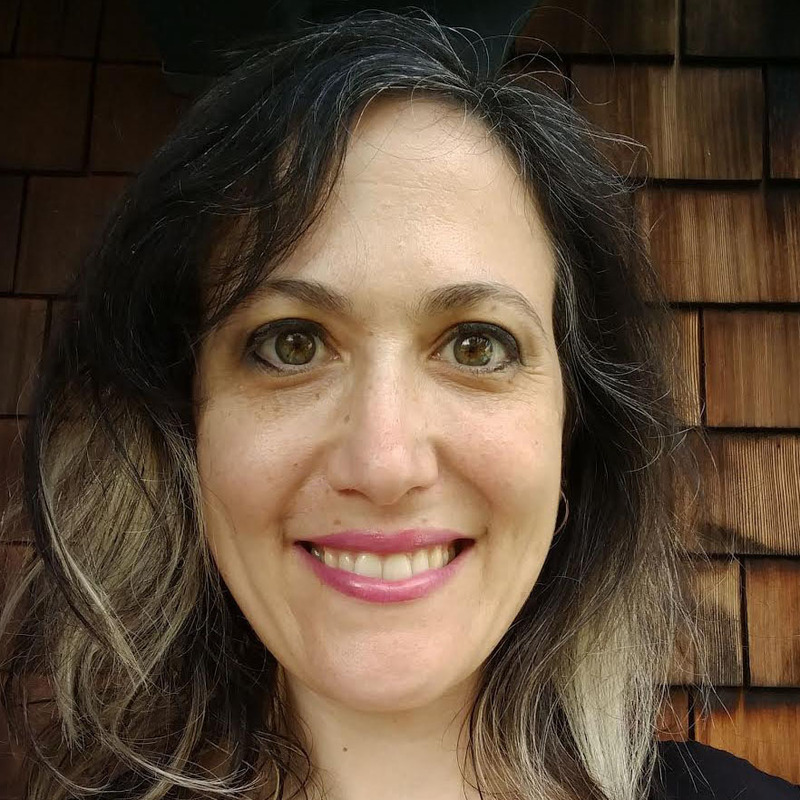 Whether praying in a redwood grove or celebrating a bar mitzvah in a synagogue, the primary goal is the same — to be in a space that feels sacred and special, “that conveys a sense of values,” said Kol Emeth’s Rabbi Booth. In this chapter of the Jewish American story, design is adapting to reflect contemporary expressions of faith and identity.